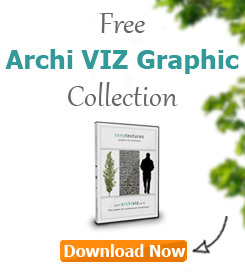 Special tree branch graphics to use as foreground element in architecture visualizations to bring more depth and subtile realism to your renderings! Tipp: Apply a blur filter to get a more relistic look! Perfectly cut out black silhouettes of people in perspective. Enliven whole areas around and in your buildings with just one click! Bonus #3: Our 4000+ Photo Texture Library as Download-Pack! You get our complete Photo Texture Library as a one-stop download-pack! It comes along with over 4000 photos with a resolution of 1600 px x 1200 px – in total 2 GB! As you will know: You never have enough textures! If you use them to create tileable textures yourself or need various photos for your post processing in Photoshop to polish your architectural rendering. Without a solid texture library you will have no chance. 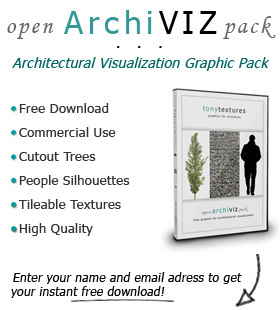 Therefore make use of this chance to either setup your own texture library or expand your existing one heavily!